Whilst climbing through the floors in Slay the SPlire, you may find certain cards in your deck that are taking up too much room. Luckily you have the option to remove them completely. However, there are limited ways in which you can do so. In this guide, we’ll show you the ways in which you can remove cards from your deck, and show you some examples of how it can be useful. 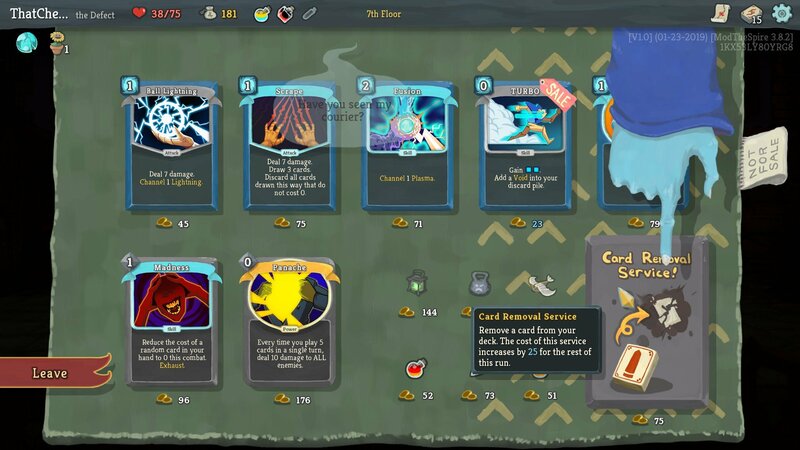 If you’re still stuck why not check out our other Slay the Spire guides right here at Pwrdown! Thinning out your deck can be useful in a variety of ways. It makes it easier to find certain cards and leaves only options that are useful to your theme. Another option is to skip picking a card if it is not of any use to you. This prevents you from filling up your deck with useless cards. There are two ways in which you can remove cards from your deck during the game. One of which is at the store. Simply enter the shop and click on the Card Removal Service. It will cost 75 gold the first time you use it, however, the price will increase by 25 gold for the rest of the run. So use the option wisely. Alternatively, you may be lucky enough to find a random scenario that provides an option to remove a card. It could appear in a variety of ways and may or may not come at a cost. Again, consider how you could use it to your advantage.